posted date, we will ship right away and UPS claims your order will be delivered on time for Christmas. Dec. 12 and Dec. 24. However, we have found them to be extremely reliable and timely. ORDER BY 1 PM (EST ZONE) OF THE DEADLINE DATE BELOW TO RECEIVE ON TIME FOR CHRISTMAS! 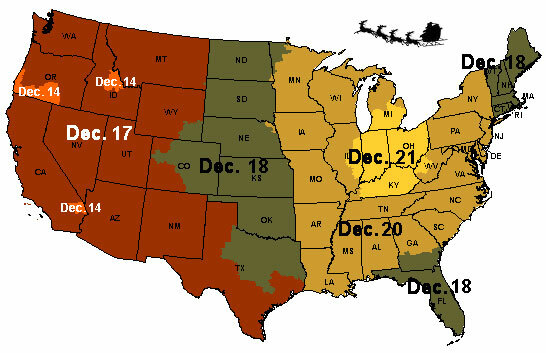 "Shipped by" Dates listed on map will arrive Thursday Dec 24. We will ship right up to the last minute, but it takes UPS a certain number of days to transport and deliver from us to your door. The number of days depends upon how far you are from us in Ohio. Your Last Day to Order is based on UPS being able to deliver in the timeframe that they quote. We have found them to be very accurate and on time with their deliveries, but we cannot guarantee their performance. If you have us ship late, it is at your risk of being on time for Christmas. The following is the very last day we can ship and have UPS get it to you on time for Christmas. Remember, Christmas is extremely busy for UPS, so give them as much time as possible. Be sure to give us a good telephone number to reach you all day in case there is a problem filling your order. We are the manufacturer of these high quality bean bag chairs. When we run out of a certain color, we just make more. Most of our chairs are IN STOCK READY TO SHIP NOW! If your order is not in stock, we will call you to let you know when we can ship this item. Or, if you prefer, we can help you select an alternate color that could ship immediately. We ship from Spring Valley, Ohio. The further you live from Ohio, the longer it takes in transit. The chart above shows when you must order by to have the chairs arrive on time for Christmas.